Sri Lanka's Country Representative of the UNICEF Mr. Ted Chaiban Wednesday handed over a consignment of vans, motorbikes and computers with printers valued at about Rs 17.7 million to the North East Provincial Ministry of Education, Cultural Affairs, Sports and Youth Affairs, as a step to support and strengthen the monitoring capacity of UNICEF's projects in education. Mr. Ted Chaiban first handed over the documents of the vehicles and motorbikes to the NEPC Chief Secretary Mr.S.Rangarajah who in turn handed them over to the Provincial Education Ministry Secretary Mr.R.Thiagalingam. 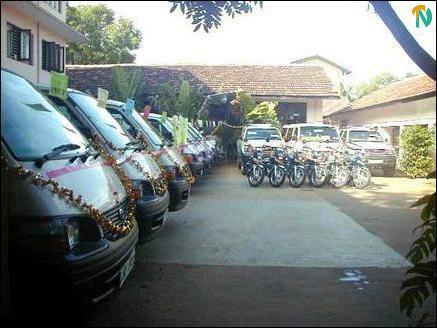 Mr.Thiagalingam gave the vehicles to the zonal directors of education of Akkaraipattu, Maha Oya, Batticaloa, Thunukkai, Kalkudah, Mannar Madhu, Killinochchi, Islands and Vavuniya North in the northeast province. 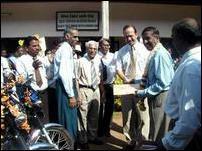 Motorbikes were handed over to the three zonal directors of education of the Trincomalee district. Earlier Mr. Ted Chaiban, UNICEF Trincomalee representative Ms Gabriele Elroy, Mr.Rangaraja, Mr.R.Thiagalingam and zonal directors were taken in a procession to the venue with St.Jospeh College band music in attendance. Addressing a meeting held at the provincial education ministry auditorium Mr. Ted Chaiban said UNICEF implemented programmes worth US$9 million to communities in the North east of Sri Lanka. The programmes focused on supporting children in these areas through early childhood care(health, education, water and sanitation), education and child protection. 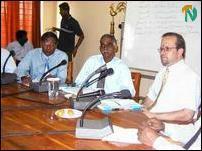 Following decisions at the peace talks, UNICEF also facilitated the joint development of the Action Plan by the LTTE, Government of Sri Lanka, Tamil Rehabilitation Organization (TRO), Save the Children and UN agencies such as International Labour Organization, UNDP and non-governmental organizations, Mr.Chaiban added. On the Learning Years Programme Mr. Chaiban said that the overall objective is to assist the development of Sri Lanka's education system to provide access to quality education for all. UNICEF recognizes and provides support to deal with low retention rates and the low level of learning achievement of children during the learning years of 5 to 14 years. The goals for 2003 were to to reduce non-enrolment, reduce absenteeism and to reduce the number of children between 5 to 14 years old from dropping out of school by 10 percent. We also wanted to improve the achievement of essential Learning Competencies (ELC) by 10 percent, Mr.Chaiban said. "Two additional objectives were set specifically for the conflict affected North east; to provide access to primary education to atleast 50 percent of affected children in the North East; and to develop 10 percent of primary schools as Child Friendly Schools," said Mr. Chaiban. He said supply of 68,250 school kits to all Grade 1 children in the North East has increased enrolment in the area as a part of an intensive "Every Child back to School" campaign to create awareness in society on the importance of schooling. UNICEF took the lead in assessing and presenting the education needs of conflict affected areas through two phases of needs assessment. The first was done in January 2003 and the second phase was conducted in partnership with the World Bank and submitted to the Tokyo Donor Conference in June last year. These assessments have provided fundamental information to all stakeholders for the rehabilitation in the conflict-affected area, said Mr. Chaiban. A total number of 244 damaged schools were rehabilitated in the North East and motorbikes and vehicles were provided to zonal education offices and the provincial department to support their monitoring capacities. Securing transportation has allowed them to reach more remote areas where children are more likely to be deprived of education opportunities, said Mr. Chaiban. He added that Catch-up Education targeted 23,500 children in the North East who have missed schooling. This included the development of teaching materials and learning aids, teachers' training, and parents and community awareness on education. "Major constraint to improving education remains the shortage of qualified teachers in the North East, a shortage of 5800 in Tamil medium and about 200 in Sinhala medium. We were able to discuss this problem with parties concerned and moves are afoot to appoint more teachers. The provincial authority should accelerate the recruitment procedure," said Mr. Chaiban. NEPC Chief Secretary Mr.Rangaraja lauded the assistance by the UNICEF to bring stability in the education sector of the province. 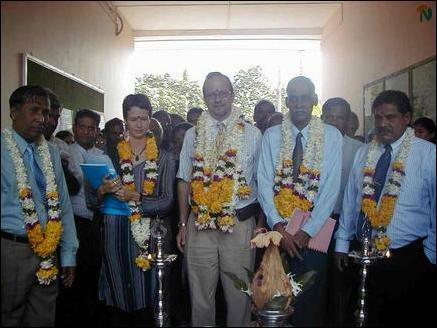 "UNICEF's continued assistance is necessary", said Mr.Rangarajah. "If we are thinking of a new structure of governance it is inevitable that the community may have to take over major responsibility in the educational development of child leaving the major direction of policies in the hands of the State," said Mr.Rangarajah. Mr. Thiagalingam made the inaugural address. Education official Mr.S. Saravanapavan proposed vote of thanks.